WOW! The Swedish Open was awesome, the World Tour circuit now moves onto the Austrian Open which begins from the 6th November to 11th November 2018! China's Fan Zhendong, has entered the Austrian Open! China's Zhu Yuling enters the Austrian Open as the number 1 seed. For full player entries click here. A fantastic event to follow, be sure to get involved in the TTD topic and get involved with the discussions. We can use this thread as a means to display all the latest results, videos and news from this spectacular World Tour event! What are your predictions from each event. How does the seeding work? For example Mattias Falck is WR#12 and not in the top 16 seed. Is it up to the organiser to randomly select the seed? It is based on the 10/2018 ranking. Ma Long hasn't withdrawn yet? Correct, it's a DHS W968, same as Ma Long. M'Ito!Is she still on fire? Main draw is out. 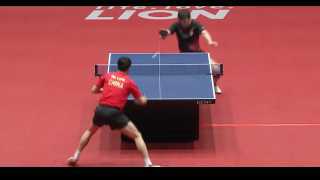 There is a big chance for ma long- timo Boll Match. I thought ML isn't playing? He is in main draw. Last edited by Loopadoop; 11-05-2018 at 06:00 PM. Of course it also depends on which qualifiers make it to the main draw but it seems like the second quarter (CM, CXT, LSW) will be fought rather intensely at the moment. A possible rematch between ZYL and Ito in the first quarter will be interesting too. The third quarter appears to be evenly matched for now. Judging from past records, WMY will probably take the fourth quarter. I don't think Mima Ito can keep up her consistency from last week for the whole tournament this week. Come on, Mima, keep on the beast mode, now please crush everyone 4-0 including DN and LSW !! !